The 5th ASMA India Study Trends 2018 (ASMA 2018) is distinct from the ASMA Report 2017 on many levels. This year we’ve expanded the scope of research categories further. In addition to the categories of Strategy, Learning and Pedagogy, Alumni Relations and Corporate Relations, we bring to you 3 new categories of Academic Research, International Relations and Student Life-cycle to share the latest in how digital influences the vast canvas of academia. Additionally, we have tried to take a sneak peek into the future role of digital media in academia. 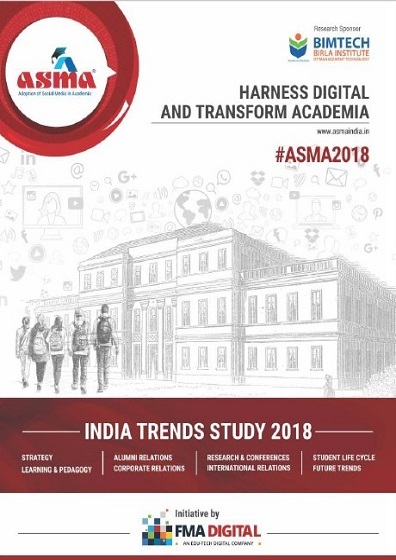 An intensive mapping of the social media and digital technologies in universities and colleges has been carries out, touching upon the emerging role of social media, focusing on two important verticals of higher education covering B-Schools and Engineering Institutes in India. It is also capitalized with new dynamic of social media and online learning with a sustainable model of adopting social media in Higher Education.